Just as four friends, Kris and his brother Wolf, and Tamara and Frauke find themselves with no direction in their lives, an idea surfaces—an idea so outrageous it just might work. They establish a company called “Sorry,” and they take on the responsibility of apologizing to people for actions perpetrated against them by others. They advertise minimally at first, but the word quickly begins to circulate that this company will apologize for actions such as terminated employment or broken romances, and people soon realize that they can make amends but never have to get their hands dirty. Within months, the clients are lining up to use Sorry’s services and the money begins to roll in. The four friends purchase an old villa, where they live and work, and their lives seem to be turning around until a most unusual situation slithers in to the inbox. They accept a job that brings them face-to-face with a dead woman. Not just dead, but brutally murdered. The horror of the deed, and fear that if they do not follow the explicit directions they have been given, that those they love the most will suffer, brings them to a decision that will change the course of their lives. They follow the directions given them, apologize to the dead woman, and sterilize the murder scene. Unnerved by the situation, Frauke searches out a friend in the police department and by the time the two arrive back at the villa, the story takes another unexpected turn. Kris, Wolf, and Tamara deny the story given to the police, the woman’s body has disappeared from its grave, and the police now have no excuse to pursue a non-crime. Thinking that their actions have finalized the project, the group soon discovers that the crimes have just begun and their involvement falls deeper into confusion and frustration. The friends follow unexpected twists and turns, come face-to-face with their own mortality, and must also face life situations that they have previously chosen to ignore. The construction of this plot is like an accounting ledger, with a debit and a credit side. On the credit side, Mr. Drvenkar’s narrative and dialogue are strong and move each section of the story along. He selects his words with care, using active verbs and descriptive nouns that draw a clear picture of each scene. His technical skills are clearly exceptional; each scene is carefully crafted within itself. On the debit side is his decision to use what can only be described as an “experimental” writing style. His scenes jump from first person to third person to second person and back; he sometimes writes in the present tense, other times in the past tense. He often leaves his reader in the dark as to which character is taking what action against whom. His time lines jump forward and backward with many scenes presented so far out of order as to be confusing. The relationships between many of the scenes do not work for any reader who is a purist and expects a story to move logically from beginning to middle to end. While there is nothing wrong with an experimental style, and it can do much to advance writing in general, it is an acquired taste, like eating okra for the first time: Some people might like it immediately; others may take a pass. 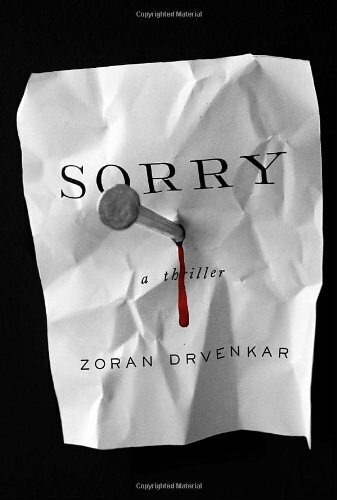 It’s a matter of taste, and in Sorry, Mr. Drvenkar’s writing style will not appeal to the masses.